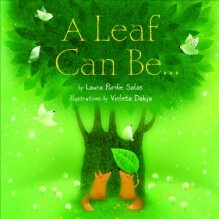 A leaf can be a . . . Shade spiller Mouth filler Tree topper Rain stopper Find out about the many roles leaves play in this poetic exploration of leaves throughout the year. Lovely, lovely. I'm a big fan of trees and leaves. Magical illustrations make this book a real treat.